Do you know what chilaquiles are? They’re one of the Accidental Locavore‘s favorite breakfast/brunch foods. 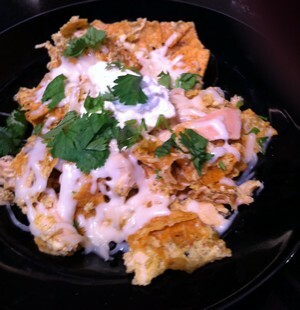 Chilaquiles are a mix of (leftover) fried tortillas cooked with salsa and various add-ins. Delicious! This past weekend I was reminded of them when my friend and I had brunch at PS 450, where they do them with red salsa and eggs…perfect brunch. This morning as I was watching NY1 (a morning without In The Papers, is like a morning without caffeine) there was a report from Chow.com. Turned out to be all about chilaquiles. Alex Van Buren likened them to nachos, but eaten with a fork and knife and she’s right. They’re super easy to make, kind of like scrambled eggs with tortilla chips. 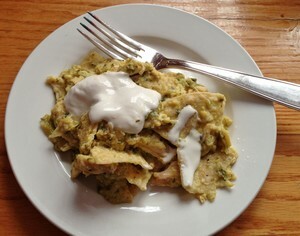 Chilaquiles are good for using up leftovers. Much like nachos, you can toss anything into them and they’ll taste great. Here’s the version I made for lunch (for 1 person), but feel free to multiply and improvise. Start to finish this took about 10 minutes (not including the salsa). Mix the egg and salsa in a bowl, add the chips and chicken and toss to coat. Heat a large saute pan over medium heat, and add the chip mixture. Cook until the egg is cooked and the chicken is warmed. Plate. Top with the cheese, sour cream and cilantro. Red salsa will also work, but I always prefer green. Put the tomatillos in a pot of water to cover, and bring to a boil over high heat. Cook until they change color, they will go from a bright green to an olive drab. Drain. While the tomatillos are cooking, put the unpeeled garlic and the chiles in a small frying pan and toast them over medium heat until browned on all sides. Remove from heat and when cool enough to handle, peel the garlic. If you want you can seed the chiles, then coarsely chop them. Put the cooked tomatillos, the garlic, chiles, and cilantro in a food processor or blender, and process until everything is combined and the consistency is to your liking. Taste and add salt, additional chiles and/or cilantro to taste. Start with one chile, and then add more depending on how hot you want it. As long as the Accidental Locavore has been on sort of a Mexican kick, here’s how I make guacamole. Since it’s so simple, it’s always surprised me that whenever I make guacamole everyone goes crazy for it. The secret is lots of cilantro. Even if you’re not a big cilantro fan, just close your eyes, and go for it. The other tip is to save 2-3 of the avocado pits, clean them and put them in the middle of the guacamole to keep it from discoloring. Mix the avocado, tomato, onion, cilantro, chiles, lime, and salt, slightly mashing the avocado as you mix. Taste and add additional chiles, lime and cilantro according to your taste. Serve and enjoy. Put the pits in the middle of the serving bowl (see photo) to prevent browning.